Just like a projectionist, Voutas is concerned with framing the film’s proceedings. A red curtain acts as a framing device for the film; we begin and end the movie on an image of the type of hanging, billowing red velvet that encases a cinema screen. Big Wong’s own understanding of the world is so grounded in the context of the cinema that he claims early in the film that he used to believe Italy and France were entirely black and white, as he only knew Europe through black and white classics.The film itself is broken into chapters that take their titles from whatever role Big Wong is playing at the time, starting with “The Projectionist.” These reframings are an astute choice in a film interested in how one’s status in life influences one’s perception. Naixan’s performance as Little Wong lends “King of Peking” the humor it needs to keep the darkness of Big Wong’s financial situation from overtaking the film. Little Wong performs all jobs in the fledgling empire with gusto. He is the pitchman, promising that a film is a “rip-roaring” good time. He is security; his father indicates him to customers, warning, “See my son? He’s watching you.” He provides testimonials for the power of their product, letting one film fan know, “I used to be dead. Watching this film brought me back to life.” Little Wong also offers the film great pathos, though, serving as his father’s conscience. Whenever his father drives his small car from screening to screening, Little Wong sits in the back seat; the cramped quarters position him above his father’s shoulder and place him in the position of angel or devil giving advice, especially as he comes to doubt the morality of Big Wong’s decisions. 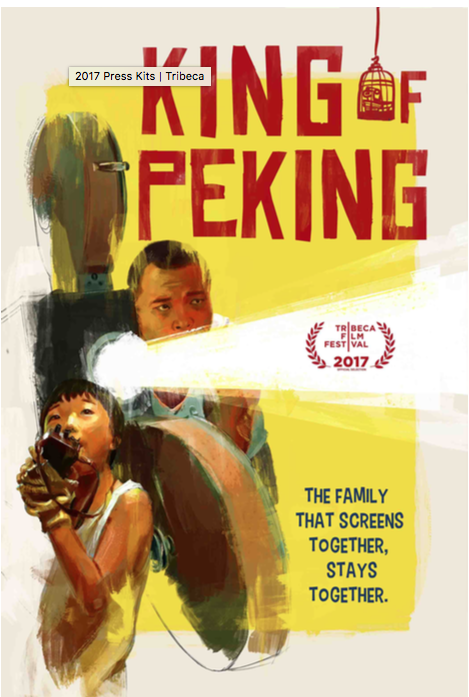 Naixan takes what could have been a one-note “cute kid” role and imbues it with humor and humanity that make “King of Peking” a crowd-pleasing entry in Tribeca 2017.